when the moon is waxing that it will make your hair grow back two to three times faster? Yes, the moon has a major impact on hair growth! I know the concept of cutting your hair to stimulate growth is a concept that does not make sense to some of you reading this, however in life not everything will make sense to you, but that is no evidence that it will not work for you. You cannot lean to your own understanding, sometimes just accept and believe by faith that a thing is true and that it will work for you. The concept of using the moon phases to create increase is not a new one, since biblical times man has used the moon to tell them when to plant, trim and fertilize. The same concept which farmers use to reap a bountiful crop can also be applied to increase hair growth and thickness. I put this method to the test on August 17th, I trimmed my hair all over taking off around 1/2 inch, but from my bang I cut 2 whole inches. I cut so much because I wanted to clearly, be able to see and measure with accuracy any hair growth I incurred after my cut. 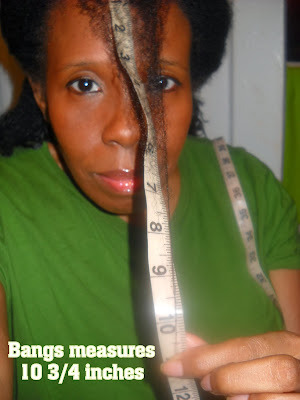 On August 17th my bang measured 11 inches, I cut off 2 inches which left my bang at 9 inches. I wrote down my notes in a hair journal then I continued the CoilyQueens haircare regimen as I always do. My first length check occurred on September 1st, at which time my bang still measured 9 inches, of course I was somewhat disappointed, but it had only been 13 days since my cut. I did my next length check on September 22nd and to my delight, my bang measured at 1 and 3/4 of an inch! My hair grew almost 2 inches in 35 days. Delightful an amazing! Measurements taken 9/22/13 almost 2 inches in 35 days! New moon equals increase growth. In order to increase your hair growth rate and thickness you must cut your hair during the new moon phase, when the moon is increasing into a full moon. Do a search for a lunar calendar and mark the day you are in a new moon, it maybe different days according to where you live. You want to mark the days in advance when the new moon is increasing toward a full moon. This may sound more difficult than it actually is, you can find websites that will tell you when your area is in the new moon phase and waxing. You want to cut your hair around the last 3 eligible days as the new moon is increasing into a full moon. You can trim a little or a lot, the amount of hair you cut has no bearing on the amount of growth you may receive. Trying to make it easy for you! After receiving feedback from some of you, I realize that different sites have conflicting suggested days in which you can cut your hair to increase growth. So I did more research and compared days amongst 3 different websites. There is one date which all three websites agree on and that date is December 9th. Two of the websites agreed on December 14th. I used the Moon Phase calendar, in combination with my spiritual discernment, and selected the best days you can cut your hair to increase your hair growth. Remember you want to schedule your hair cuts after the new moon phase, as it is increasing into a full moon. Next full moon is December 17th. Will you try the New Moon method? If so, please leave a comment below, and list the day you chose to do your cut, how much you cut and how much your hair grew after 35 plus days. Your hair may take longer to see growth than mines did, so the 35 days is just a generalization. It seems timing it just right does take accuracy. But done right you will be amazed by your results. Nothing to buy or do daily besides taking care of your hair by having a good haircare regimen. Need help with your regimen? Regimen help here. So there you have it ladies my hair growth secret! Before you go please subscribe to this website, once you subscribe you can then leave a comment below and I will respond to your question. Being subscribed also makes your eligible for free hair coaching. I live in MD. Are these dates good for me too. MD that is Maryland correct? If so then yes those dates are good for you also. I live in Maryland as well and plan on cutting my hair November 12 or November 13. Quick question, maybe even silly - why is the Saggitarius sign not a good sign under which to cut ones hair? Hello I am not one to get much into zodiac signs, but certain parts of astrology are true. Planting according to the position of the moon is even biblical. I may remove what I brought up about Sagitarius sign, But according to astronomy the moon in Sagatarius is not good because that is a barren, dry and fiery time. The fire quality will leave hair dry and brittle. Those who practice medicinal Astronomy suggest this time is good for detoxing the whole body. If you want to maintain a cute short haircut then cut during the waxing moon during December but if you want to grow long hair do not cut during this time at all do it the month before or the month after. Hope this helps some. Hello, blessed one. I will be getting my first hair cut in 6yrs THANKS to you!! U have convinced me! I live in Tennessee, would the 13th -17 be the right time for my state? Please let me know, and being an older woman I have heard of the concept(by the moon hair cutting) but never gave it any thought. I am also following along with ur Liquid Gold challenge on-line, even though I did not register in time, I have purchased my products so I can "grow along " with yall Mrs. V. Mrs. V. Mack I have explored your pages pretty thoroughly and I have not come across ANYONE as knowledgably as U about hair. I feel very BLESSED to have found ur web-page, and do thank my GOD for you Mrs. V. Mack. Thank you so much for the kind words! I hope you signed up for the challenge so we can chat about your hair on facebook. If you have not, you can still do so, we are beginning our second session this week, the first 4 weeks produced great results. I am excited! Find the article here and follow the link in the article. Thank you for your blog, it's very helpful. I was always told to cut my hair on a full moon but I haven't been persistent. I have been reading other websites where it says that the best time to get a haircut is in a New Moon Phase and during Pisces, and I was planning on doing it but I have a problem because according to Luan App on my phone it says Pisces New Moon falls this Feb 28 @ 11:59:21 PM. Where am I going to find a salon open at such hour? I am even considering to do my own hair cut but I have a feeling, I will do a bad job. Any advice Please reply ASAP. I last trimmed my hair in December and plan to trim it again in March, 2014. I consulted the Farmer's Almanac Lunaf Moon Phase websites to figure out the best date would be March 1st. Is this correct or do I need to push it out further? Hi, my hair is short and I have not really been cutting it, also I desire to retain some length.I have been praying about my hair and I ran across this site.i really would like some length with out having to take pills.today is march 4, I will start you're regime for washing and then cut on dates given... I prayer. .I begin this journey. Hello okay a ta bit confused so i have to cut my hair three days before the new moon. in this case the new moon will be out on the 27th of june so i can cut it tomorrow for my hair growth results? See the June article for the dates for June New Moon hair growth. As in I love you!!! Thank you so much. Will you be publishing dates for August as well? It's 2016 and I'm NOW finding your blog. I don't know WHERE TO BEGIN. Address the most important issue first. Health of your hair over the styling of your hair. Hair styles better the more hydrated it is. So better styling will come. Please sign up for my upcoming double your hair growth challenge. Do a search for hair growth challenge on this site, or just scroll down several articles.